The holy, glorious, all-laudable Apostle and Archdeacon Stephen the Protomartyr (Gk. Στέφανος, "crown") was an early Christian convert from among the Hellenistic Jews, one of the original seven deacons ordained by the Apostles, and the first martyr of the Orthodox Church. The Church remembers the martyrdom of St. Stephen on December 27, and the translations of his relics on August 2, as well as commemorating him on June 15 with Ss. Fortunatus and Achaicus. St. Stephen was a Jew living in the Hellenic provinces, related to the Apostle Paul and one of the first seven deacons ordained by the Apostles to serve the Church in Jerusalem (thus making him an archdeacon). In the words of Asterias:St Stephen was "the starting point of the martyrs, the instructore of suffering for Christ, the foundation of righteous confession, since Stephen was the first to shed his blood for the Gospel." The Holy Spirit worked powerfully through his faith, enabling him to perform many miracles and always defeat the Jews who would dispute with him. The Jews in their hatred of St. Stephen lied about him to the people, but St. Stephen with his face illumined reminded the people of the miracles God had worked through him and even rebuked the Jews for killing the innocent Christ. The people were enraged by what they thought was blasphemy and 'gnashed their teeth' at Stephen. It was then that he saw his Christ in the heavens and declared it so. Hearing this, the Jews took him outside the city and stoned him to death, with his kinsman Saul (later St. Paul) holding their coats while they did it. Afar off on a hill was the Virgin Mary and St. John the Theologian who witnessed this first martyrdom for the Son of God and prayed for him while he was being stoned. This occurred about a year after the first Pentecost. The body of the holy Protomartyr Stephen, was left at the foothill of the city for two days to be eaten by dogs. But on the second night, Gamaliel— teacher of the Apostle Paul and the Apostle Barnabas— along with his son, secretly came and took the body to his own estate, in Capharganda, to be buried. Nicodemus, who died while weeping at this grave, was also buried there along with Gamaliel's godson Abibus and Gamaliel himself upon his repose. After many years the memory of St. Stephen's burial place had left the minds of men, until 415 when Gamaliel appeared three times to Father Lucian, priest at Capharganda. He revealed to Fr. Lucian the place of his burial and everything about it. Fr. Lucian received the blessing of the Patriarch to exhume the saints from their grave where a strong, sweet fragrance filled the cave. St. Stephen's relics were translated to Zion and honorably buried, and many of the sick were healed by his relics. 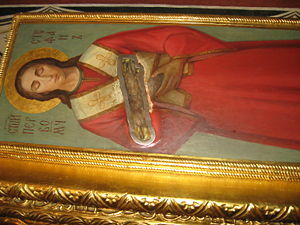 The other three relics were placed inside a church atop the cave on a hill. Eventually, his relics were translated to Constantinople. As mentioned above, the main commemoration for St Stephen is December 27, the day of his repose by martyrdom(stoning). The Orthodox Church celebrates the discovery (opening) of the Saint's relics on September 15 and the Translation of the Relics of Protomartyr Stephen on August 2. The September 15 feast day celebrates the discovery of Stephen's relics in 415, after which they were solemnly transferred to a church built in his honor in Jerusalem. Later, during the reign of Emperor Theodosius the Younger (408-450), the relics were transported to Constantinople: this event being commemorated on August 2. January 4 marks the commemoration of the "Synaxis of the 70 Apostles". Since St. Stephen was included in these 70 Apostles mentioned in the "Acts of the Apostles", he is also remembered on January 4. Thou hadst fought the good fight. "O Lord do not charge this sin against them!" And today his servant departs from life. And today His servant is stoned to death. For the sake of Christ Holy Stephen became the first martyr. This page was last edited on January 25, 2013, at 23:41. This page has been accessed 108,023 times.